reporting Israel has now threatened the Assad regime if Syria attacks Israel, Israel will launch a massive attack against Syria, Lebanon and Gaza…..! And as the Drudge Report’s recent HEADLINE, reporting WAR DRUMS BEATING IN THE MIDDLE EAST, it appears that is the case at the present http://www.drudgereport.com …………. Augusto Perez [Oct. 15] has recorded a new audio file with GeorgeAnn Hughes entitled: THE END OF TIME 27, mp3 available for listen or download on The Byte Show………… http://www.thebyteshow.com …This is a very serious and urgent WORD from Augusto to those ‘who have an ear to hear’….Augusto’s website http://www.theappearance.com ……. As I’ve reported in a previous blog, been reading the book SURVIVORS by James Wesley Rawles http://www.amazon.com a novel of the coming collapse ~ reminds me somewhat of the novel ONE SECOND AFTER and “Survivors” also left my guts twisted with tension as I felt a part of the characters and the tribulation they suffered. James W. Rawles takes you on a search for family safety as everything falls down. James writes a blog about the family safety http://survivalblog.com ……! And as James Wesley Rawles may point out “How to survive the end of the world as we know it”…! 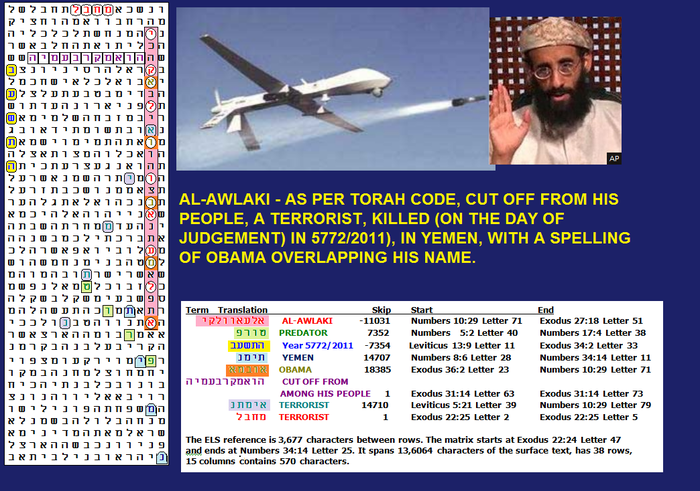 Barry Roffman has completed some Torah Code research and shows matrix data on a number of subjects [sample above image] on his website http://www.arkcode.com so go to Barry’s website for Torah Code research, multiple subjects….! By the way, did have problems/difficulty with my Yahoo Group last night and today on posting. A number of posts I wrote “internal” inside Yahoo vanished and never were posted in the Group section. It seems as we are struggling in very serious times and need to share data, those against the sharing work harder, be it anti-christ spirit, Goblin or maybe even a Troll….!!! And the enemy seems to have so many minions, helpers, etc…! Always the PSALM 2 WAR, on Planet Earth, every day! Well, I’m going to pray a bit, read my Bible and then maybe turn a page or two on a new book by Steve Alten, just came out, entitled: PHOBOS, Mayan Fear [novel image above] And in the front of the book a comment by a quantum physicist to Steve Alten talking COLLIDERS, Geneva, CERN,………..and Steve notes “As you [reader] read this passage, they are happening right now”…..?????? Can’t wait to get into these books. Awesome !!!!!!!! D.
Darnette: NO!, my dear wife, this BLOG is not excellent at all. The top 1/2 of this blog is missing and two images are also gone from what I wrote. About 1/2 of this Oct.15th blog is completely gone! Folks, I’m sorry for this really bad, lousy work. Apparently, not only am I having trouble on Yahoo Group, even the WordPress Blog is troubled! Don’t know how long I can continue with this internet work ~ too many troubles and I will not continue to post 1/2 junk on the net……………..Psalm 2 – believe it! Keep trying, you are appreciated even at half-blog. The CERN thing has worried me for years. I think Ive mentioned the statue of Shiva at the entrance to the facility, the “Destroyer of Worlds”. Imagine putting that there! Notradamus seems to imply destroying “everything”. I wonder if he meant really everything on the planet or the area about Geneva. These people are doing something that is not needed to satisfy egos. This is one of the big worries, as if there are not enough other ones. Keep trying to post as long as possible. Your news is always appreciated and is the best news group. Dear Larry. …I am on the tail end of everything but i am Listening and O so grateful for all you post that helps me at least keep on rhe tail. Much appreciated. Do keep courage and keep on. Amen to what Mariel wrote, Larry. Half a blog by you is still a refreshing drop of water on a thirsty tongue!! Thank you for the link to Augusto on the Byte Show. That alone was worth reading the half blog. Amen! I agree completely with all my fellow brothers and sisters who wrote comments above. Larry, please don’t stop posting. The Lord still uses what you are able to post in a BIG way. The stuff in this blog already has me ordering those books and the link for Augusto is priceless to me so please doon’t ever let the evil one wear you down brother. Keep fighting the good fight and occupy until Jesus comes. Thank you for your posts, Larry. We love and pray for you always. I agree! I don’t know if it matters but I have pushpins placed on google earth for the towns and cities where I know the watchmen are and it just seems to help me visualize how small and close we are on this little ball in space as I pray for all of the “cyber church”……we are nothing without Him and His view is so much broader than we can even imagine! Can hardly wait to meet you all at the wedding feast! Larry stop beating yourself up, it is not your fault. Even my MAC is going haywire and that has never happened. The enemy hates us and we dislike them. We are refined as gold in the fire, they unfortunately will spend eternity in ” fire”. Thank you Larry for all that you are doing.Even half of what you had for us is so important. Hi Larry, Just a thank you for all you do for us in keeping us all informed. How are your dogs and cats been since you moved out there? Do you know when your next audio is? just watching for bears or panthers, but dogs keep them away from directly around the house. 1 dog will actually chase the bears back into the woods. She did it once ‘LIVE’ on Stewart’s recording. Larry I can’t find Augusto’s #27 the end of time, were you talking about number 26? thanks!